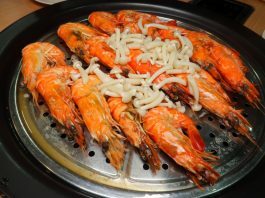 Bukit Tambun used to be my family’s favorite place to enjoy seafood in Penang, but we have been exploring other areas recently. 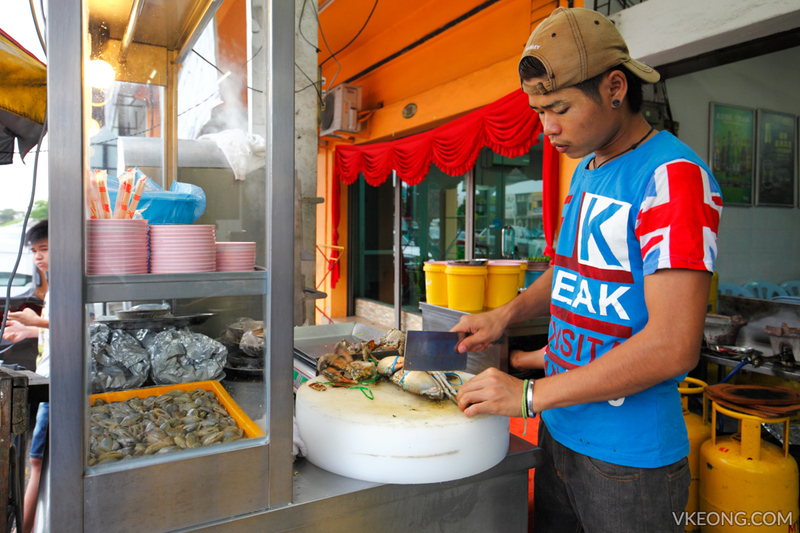 Do you know that you can get equally good, maybe even better seafood dishes in Simpang Ampat as well? For your information, Simpang Ampat is a small town south of Bukit Mertajam, next to Batu Kawan where the second Penang bridge is located at. Sieng Kee was introduced to me by my sister who had a few great meals here. 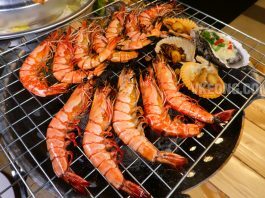 Although the restaurant’s chef and owners are young, they are highly innovative in the food they serve and have since created a few signature dishes. 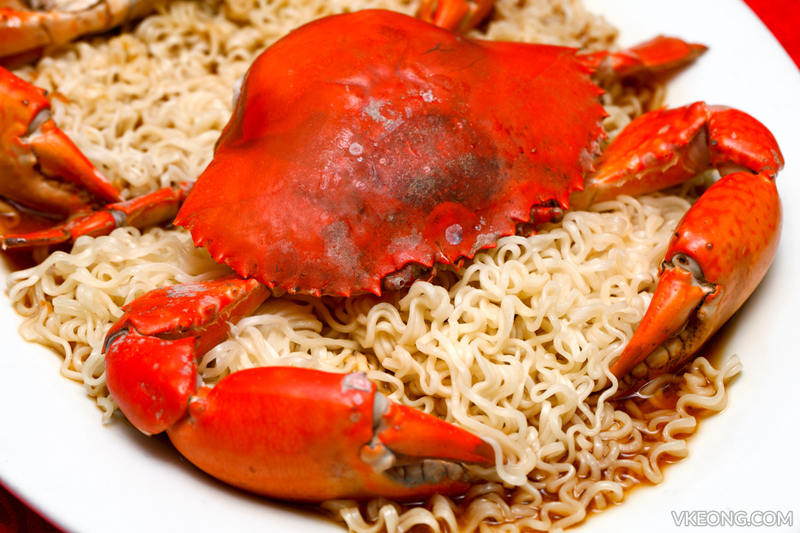 The Steamed Crab with Cintan Noodle shown above is one of them. The chef is also known to take special orders from customers as well. 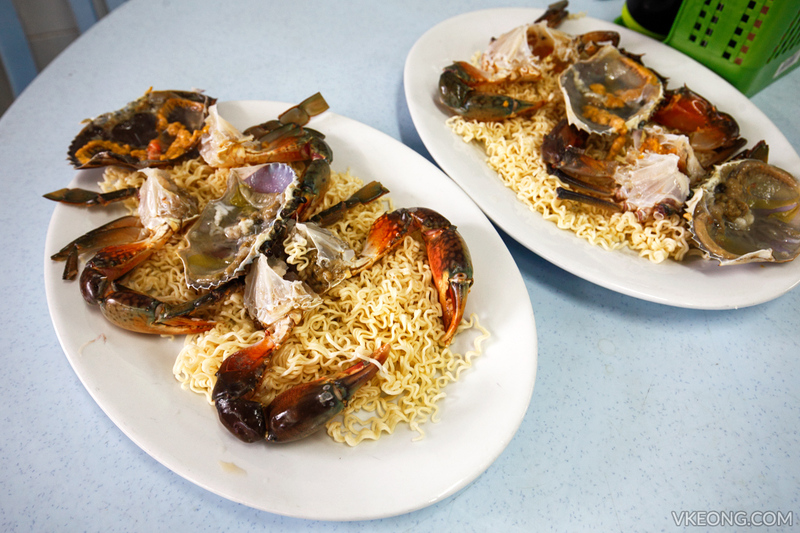 For example, the Singaporen Clay Pot Crab Bee Hoon is available here because a customer requested for it previously. Apparently, the dish was recreated so successfully that it is now featured permanently in the menu. 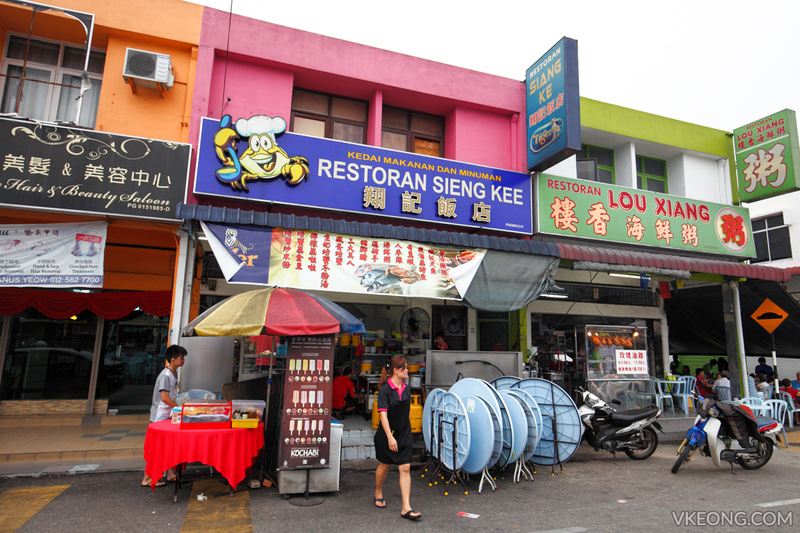 So if you want to enjoy Uncle Leong style crab bee hoon without having to pay SGD, come to Sieng Kee. 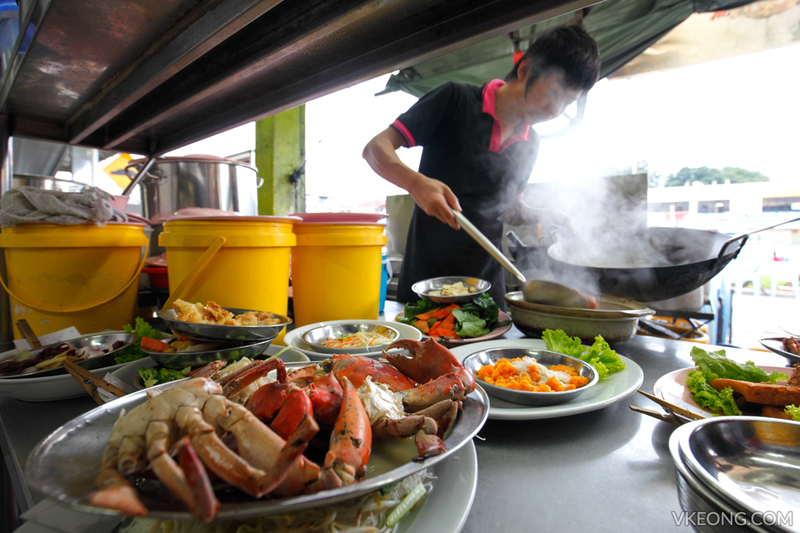 One main thing that separates Sieng Kee from the other seafood restaurants in town is the source of their seafood – especially mud crab. 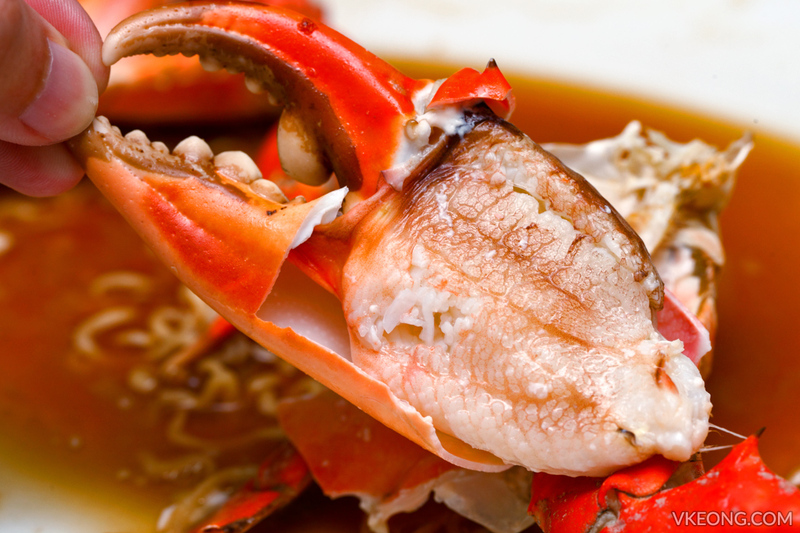 The mud crab that they use are wild-caught on shallow coasts of Penang, not those imported from farms in Indonesia or Sri Lanka. You can tell that they are wild because they have barnacles growing on the shell. As usual, the crabs are sold by weight and they are priced at RM100/kg, which is a fair price to pay considering the quality you get. We had two servings of the Steamed Crab with Cintan Noodle (蟹金丹) @ RM196 and as you can see, we got the female mud crabs which were full of rich, orange roes. 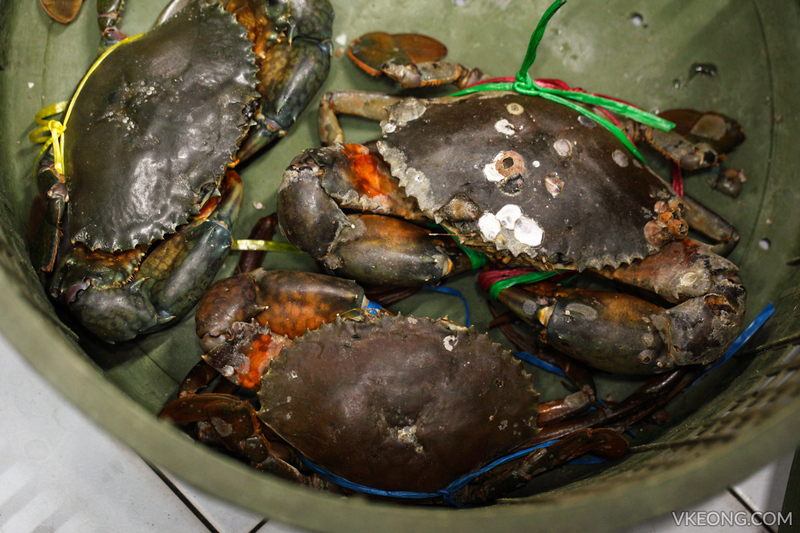 The crabs are cleaned and scrubbed thoroughly before going on the noodles. This is how they looked like before going into the steamer. The noodle was deceptively delicious, as it had absorbed the flavor of the crab through the steaming process. 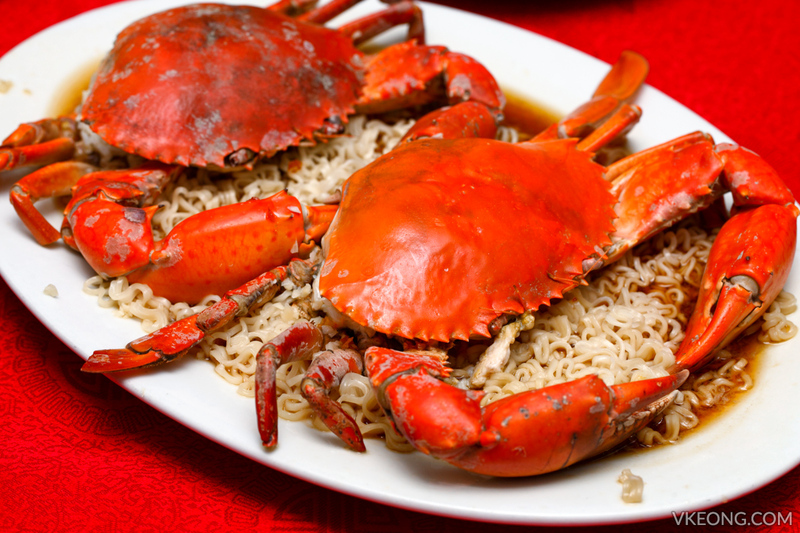 The seasoning is also kept simple and minimal, mainly premium soy sauce and Chinese wine as not to overwhelm the crabs’ natural taste. 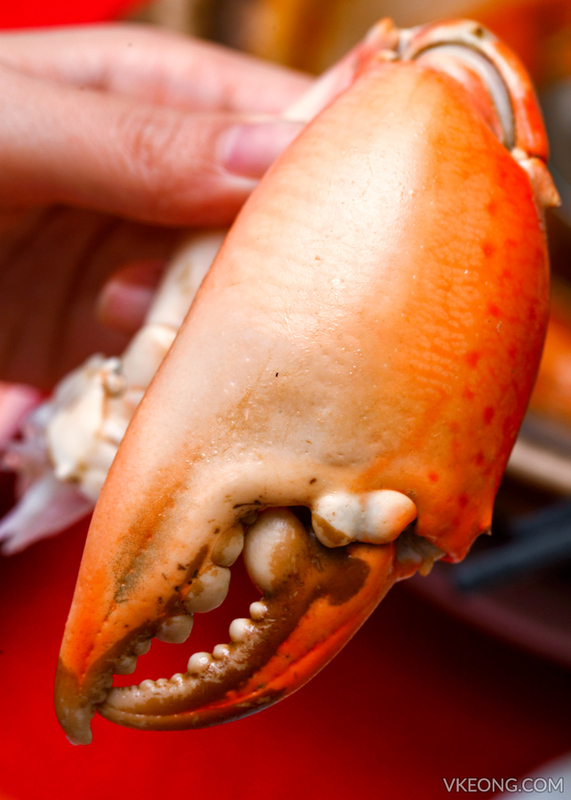 You know the crab is something special as soon as you take a bite of its flesh. The texture is extra juicy (literally bursting with juice) and noticeably sweeter than usual, it’s just a class above the rest. I have tasted a lot of crab in my life, but this was truly top notch. Other dishes we had that night included Kiwi Lala (奇异拉拉) @ RM18. With lala as fresh as these (still alive before being cooked), deep frying is probably not the best way to savor them. 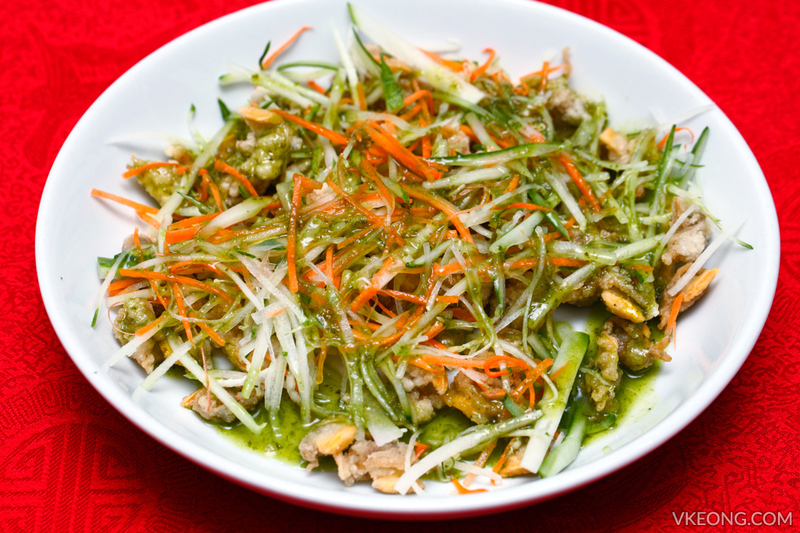 But it’s worth ordering just to try the zesty and refreshing kiwi sauce. 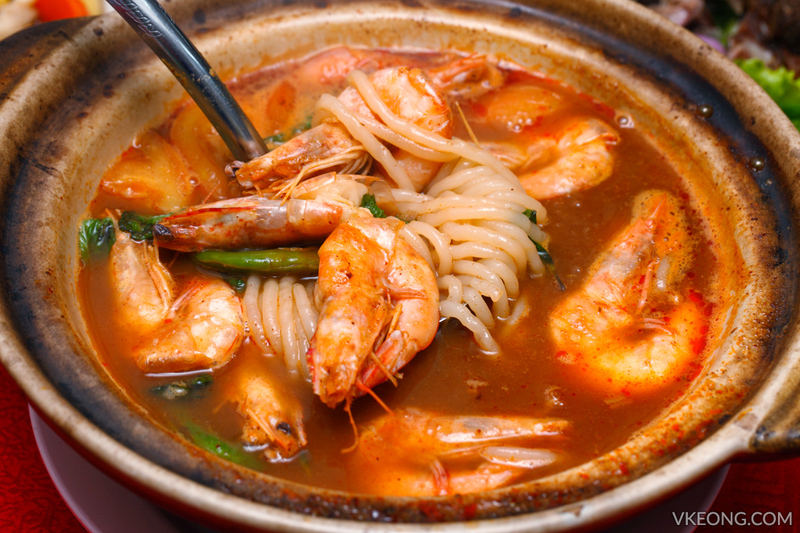 Claypot Assam Laksa Noodle with Prawns (瓦煲叻沙虾) @ RM24 – a unique dish that you will only find in Simpang Ampat. Other restaurants in the town also serves this; albeit slightly different in terms of flavor and presentation. The broth tastes a bit sweet after it had been infused with seafood, so it’s not as sour as you think. I have never really been a fan of ‘Siam Tu Kar’ (Thai style deep fried pork knuckle) @ RM46 but I absolutely adored Sieng Kee’s. 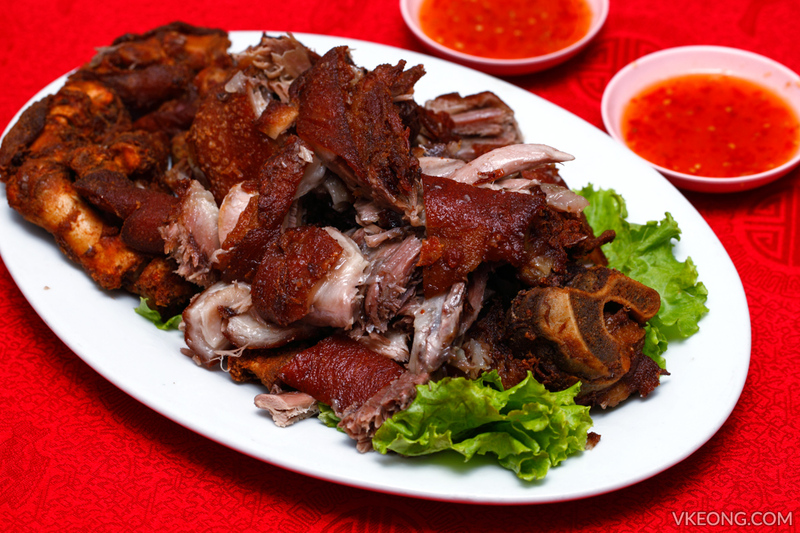 The pork skin had the perfect balance of crispy and chewy while the meat was tender and moist. Not to mention the chili sauce was great as well. Highly recommended – in fact, don’t go home without trying this. 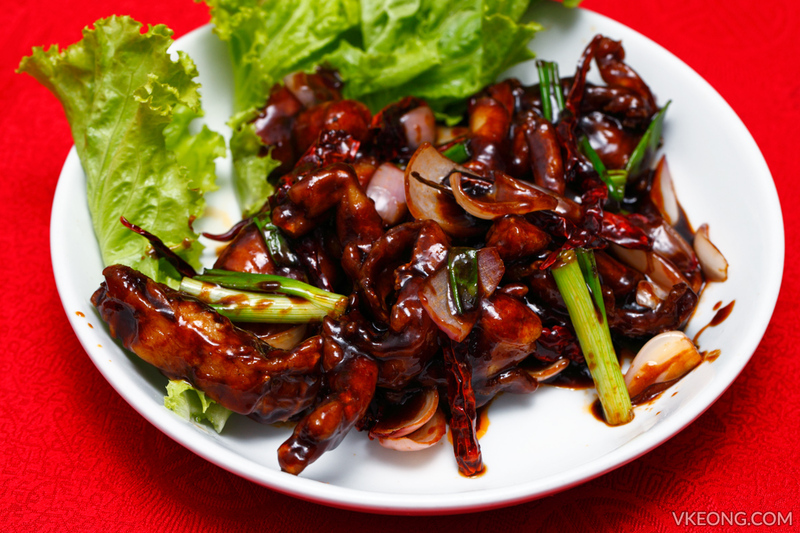 Kung Pao Frog Legs (宫保田鸡) @ RM28 is my family’s perennial favorite which we have been ordering since I could remember. Safe to say we have extremely high expectations when it comes to this classic dish, and we weren’t disappointed at all. 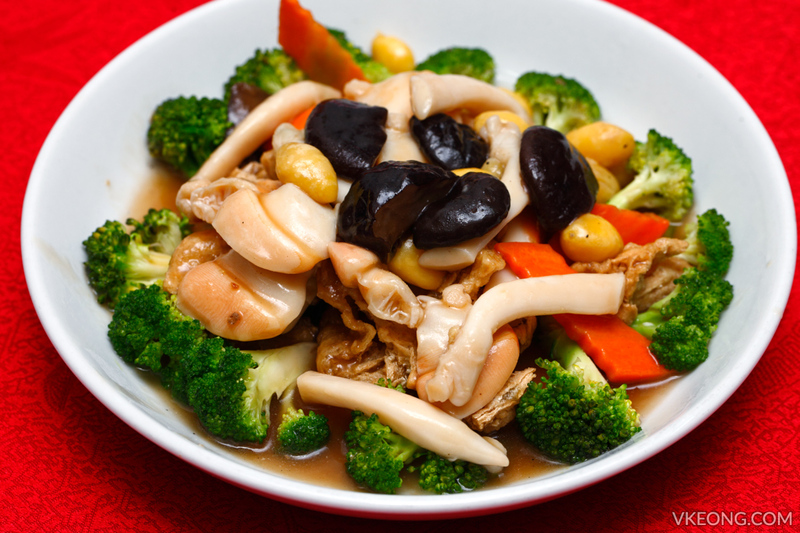 Lastly, a rather elaborate vege dish to complete the meal – Stir Fried Broccoli and Beancurd with Razor Clams (双鲍豆根) @ RM25. In total, we spent RM352 for this meal for 5 adults and 2 kids. It’s not exactly cheap but I thought the price was fair when taking into account that all the dishes we ordered were seafood based. 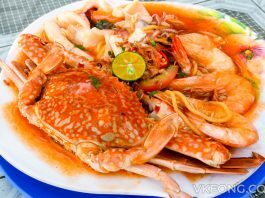 Thanks to the gratifying experience we had, we will definitely return to Sieng Kee again try the other crab dishes they have to offer.